Our spine is the one thing in our body that is easy to damage but needs to work at full steam no matter what if we want to be able to walk, run and jump around like we do now. Not only is it responsible for a lot of the human body’s movement, it also houses the spinal cord, one half of the infinitely complex central nervous system and controls the information being passed along by the brain to the rest of our body allowing us to move our muscles and feel any pain or sensation. As we get older, our spines change. Our vertebrae degenerate as do our muscles, ligaments and discs that hold the spine together. This degeneration is often the first step to lumbar stenosis and will usually eventually require lumbar stenosis disc surgery. What is Lumbar Stenosis Disc Surgery? Lumbar spinal stenosis is almost always caused by ageing and general degradation and wear on the vertebral bones, discs and muscles. It refers to a condition where the nerves running all the way along the spine suffer from being pinched or compressed by the wear of the soft discs between each spinal vertebra. Symptoms of the condition include pain in the legs, often affecting the patient’s activity level and mobility. 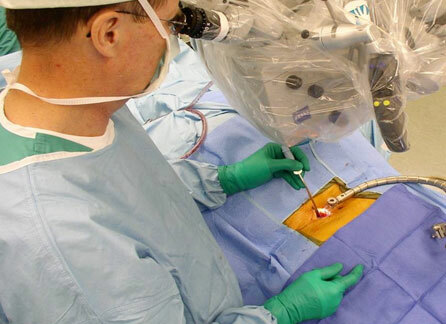 Lumbar stenosis disc surgery is a surgical procedure that aims to help and correct this. For Lumbar stenosis Disc Surgery, the patient is put under general anaesthesia and a two to five inch long incision is made along the line of the spine after which the left and right muscles of the back are dissected on both sides at more than one level. Once the spine is visible, the surgeon will remove the lamina, so he has a clear unobstructed view of the nerve roots in the affected area. The actual procedure involves trimming the facet joints directly over the nerve root to give them more room. A lumbar stenosis disc surgery is a major surgery with a long recovery time, so patients are usually kept in the hospital for anything from one to three days. The actual recovery time is dependent on their pre-operation condition and age. Directly following the operation, the surgeon will encourage the patient to walk around, however will advise patients to try not to bend, lift anything or twist around for a good six weeks primarily to avoid the sutures breaking before the incision is healed properly. Lumbar stenosis disc surgery is an expensive procedure due to the amount of time required in hospital and the complexity of the operation. It is covered by the NHS, however if you need to pay for the operation because you don’t meet the minimum criteria for lumbar stenosis disc surgery as laid out by the NHS, you will need to get a consultation from a surgeon to obtain an approximate cost of the surgery. As with all operations, lumbar stenosis disc surgery can have some complications, so ensure you talk to your surgeon and allow him to explain all of the possible complications, as well as the success rate of lumbar stenosis disc surgery.